Seemingly limitless junk food options, less time to exercise, more time spent sitting in front of computers and screens, and fad diets are just some of the many obstacles to healthy living today. Though teens often get a bad rap for not paying enough attention to what they eat, it can be tough for anyone to decipher the conflicting messages about what’s healthy and what’s not. 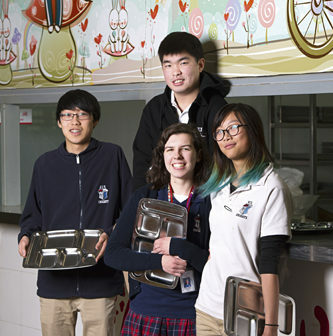 We chat with four students from Hope International School (HIS) to find out what Beijing teens think about diet and nutrition. Do you or your family have any dietary restrictions? Isaac: My family tries not to eat pork. My parents say it’s not as healthy as beef or chicken. Sarah: My mom is doing a gluten-free diet. She feels a significant difference in her energy levels. Is the local diet is healthy? Jacob: Not really because it’s oily and everything is fried. Sarah: It is really oily, but Chinese people eat a lot of vegetables and less meat so I think it counteracts the oil. Cindi: The local diet varies from vegan to McDonald’s, so there isn’t a real classification of a “local” diet. Everyone eats differently. Isaac: Mine needs a lot of improvement because I take in whatever is on my plate. Cindi: I have a major sweet tooth. I try to stay away from junk food, but then I’m thinking about it and end up eating more of it. I don’t eat much rice though, because it’s just empty carbs. Jacob: I consider my diet healthy because I usually eat at home besides school lunch, and only eat out occasionally. I don’t eat much junk food. Sarah: I could eat more fruits and especially vegetables. I eat a lot more meat than other things. Have you or someone you know tried a fad diet? Isaac: Once in a while I try to diet, eat chicken breast, and work out – I’ve even tried the no-carb diet – but my family always eats rice and it’s hard to eat separately [from them]. It can also be time-consuming to make your meals ahead of time. I’d rather sleep. Jacob: I’ve seen someone doing the one-food diet. They chose tomatoes. Cindi: I had a friend who ate only watermelon for a week to lose weight. Sarah: My friend did a juice diet for a month and only drank fruit and vegetable smoothies. My friend lost a lot of weight, but couldn’t eat solid food for a while. Have you ever taken supplements? Jacob: Protein powder mixed with milk or water, and chewable vitamins. Cindi: In elementary school, I had a zinc deficiency that I took tablets for. But I don’t take anything now. Sarah: I take fish oil capsules and Teen One a Day vitamins. Isaac: Multi-vitamins, and I used to drink protein shakes but not anymore. They say it’s chocolate-flavored but it tastes bad. There’s more emphasis on nutrition now than in previous years. Why? Sarah: Thirty or 40 years ago, there hadn’t been long-term case studies but now we see more of a cause-and-effect relationship between what we eat and our bodies. Jacob: It’s because packaged food and more eating out has caused all the health problems of today, like obesity and diabetes. What relationship does diet have with today’s standards of beauty? Isaac: It used to be OK to be a little chubby, but now people diet to lose weight. You have to be thin or you have to be muscular – it’s the way people define beauty. Sarah: You have to work harder now to accomplish what is considered beautiful. Before, people generally ate what they wanted and people were OK with that. Now, there’s so many options available, people expect you to choose the healthiest one so you can be skinny. Cindi: When people were too skinny back in the day, it wasn’t considered beautiful. Now it’s the opposite. People want to be in the minority and become the pinnacle of beauty. Where do you get your information about nutrition? Jacob: Usually online. Sometimes our biology teacher talks about nutrition. Cindi: My mom. She does research on cardiovascular diseases and she’s really uptight about nutrition. Also from biology class. We were recently learning about lipids and saturated and unsaturated fats. Sarah: Yahoo News. After I read an article, I’ll do my own research online because articles tend to contradict each other. For example, one source will say you need to have this many servings of vegetables a day and another will say something else. How do you know whether online information is credible? Sarah: It depends a lot on whether the source is just a random news article versus webmd.com. The more credible sites tend to stay on the same page with their information, whereas random news articles will say anything. Isaac: I usually judge based on the stars they get on the website rating. [laughs]Five stars, I can trust them. Four stars, eh maybe. How can teens learn healthier eating habits? Jacob: More education. Schools should officially propose a healthy diet program. Isaac: In elementary school, there used to be assemblies teaching kids about the food pyramid, but in middle school, nutrition was hardly taught anymore. Sarah: Everything is easier in a group so if you try eating healthier with multiple people, it’s better because you have others holding you accountable. What is health education in school like? How can schools improve? Sarah: For older grades, it’s lacking. People don’t talk about nutrition much because it’s a sensitive issue to talk about what people are eating. But having more open conversations about nutrition would be helpful. Cindi: Our health class is relatively new and most people don’t take it. It’s for Grade 9 and last year, only two seniors took it. Jacob: It’s only a required class for freshmen, but it should be more geared toward upperclassmen. This article originally appeared on p40-41 in the January 2015 issue of beijingkids. To view it online for free, click here (will send link later) To find out how you can obtain your own copy, email distribution@truerun.com.